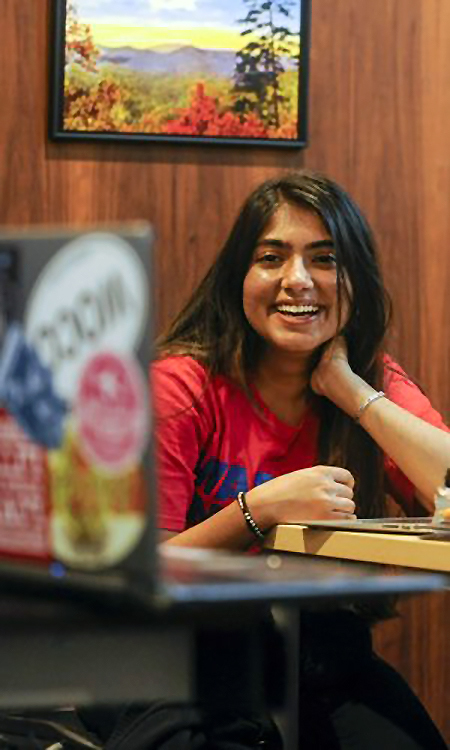 Shivani Mahajan, a student at Wofford College in Spartanburg, South Carolina, enjoyed her experience in a class in her Humanities 101 course, which allowed her to connect with peers in Egypt and Lebanon. “It is one thing to read a book or article on the region, and a whole other ball game when it comes to actually getting to interact with the people who live there,” Shivani said. Through the Stevens Initiative, Wofford is connecting its students with students at Al-Azhar University in Cairo, Egypt, and the American University of Beirut (AUB) in Beirut, Lebanon. Wofford students in the English, Middle Eastern studies, Modern Languages, Religion, and Government and International Affairs were able to connect and learn with their peers abroad. Students in Professor Courtney Dorroll’s Middle Eastern Studies course worked with peers at Al-Azhar to construct a “virtual genealogy museum,” which consisted of 15 posts in a shared Facebook group detailing each student’s life and culture in their respective communities. The paired classrooms also scheduled movie nights in which they watched films like “Cairo Time” and “A Country Called Amreka,” and posted their thoughts, reactions, and questions in a shared blog for discussion. Reflecting on his experience and what he learned in the Wofford virtual exchange, Wofford student Daniel Myers noted the impact of learning directly from his peers. “It is not just reading a book and getting general knowledge, but rather getting to know someone and by extension the culture and region they live in,” he said. The professors at Wofford, Al-Azhar, and AUB noticed a change in their students. “The openness to new ideas from students, their willingness to learn, and most importantly, their completely nonjudgmental attitude was truly refreshing. The one thing that really seemed to matter was introducing culture to another culture in a separate time-zone, continent, and with a different background. More importantly, both groups of students were actively taking part in the sessions and were curious about the students on the other side of the screen,” said Joe Soubaih, whose AUB class was paired with an Arabic class at Wofford. As part of its virtual exchange, Wofford also created a library resource guide for all students, a curated database of scholarly material on Egyptian culture, Lebanese culture, American culture, ethnography, cultural sensitivity and intercultural competency, films, and genealogy. The library guide was available as a foundation and supplement to the courses for all students.